Fantastic output from the Epson 960 printer on this paper, but I bought it thinking I could print borderless 8x10's.This option was not supported by the printer -- need to print 8x10 on 8 1/2 x 11 paper, then trim it. 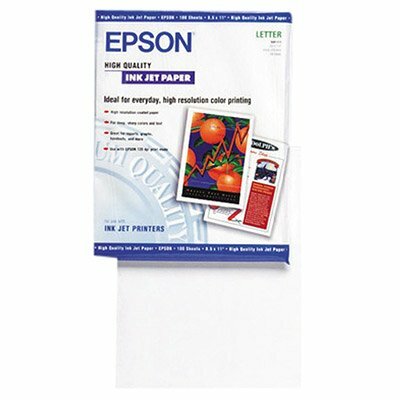 I bought this paper for the Epson 890 printer.The printer I love, the paper, I don't.This size paper isn't entered in the printer software that comes with the printer.There is no borderless 8x10 paper setting.You can manually select the size and check borderless, but the printer thinks its 8.5x11 and if you selected to print an 8x10 with your picture software the printer adds a border to 3 sides and cuts off the picture on the fourth.I played around with various paper sizes and printer options but with no improvement. This was very dissapointing.I bought 8x10 photo paper because I wanted 8x10 borderless photos, once you trim the shots down, they are no longer standard sizes for putting in picture frames.If you want 8x10 shots, buy the 8.5x11 borderless paper and trim.Its the only way to get a standard sized picture. Also, I wouldn't recommend 8x10 shots for digital photo printing.Unless you have a very high Megapixel count, the pixels are spread too wide on an 8x10 and there is visable dithering or pixelation.I have a 3.1 camera, and I have noticed some dithering, you can see the pixels or dots from the camera. Believe me paper matters. When you put the wrong paper in your printer, you get very weird results. P.S. 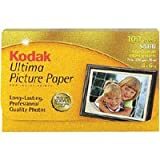 This review was before I had used Kodak's One Touch to better Pictures.Please see my Kodak Paper review prior to making your buying decision.I was really impressed with what Kodak did. 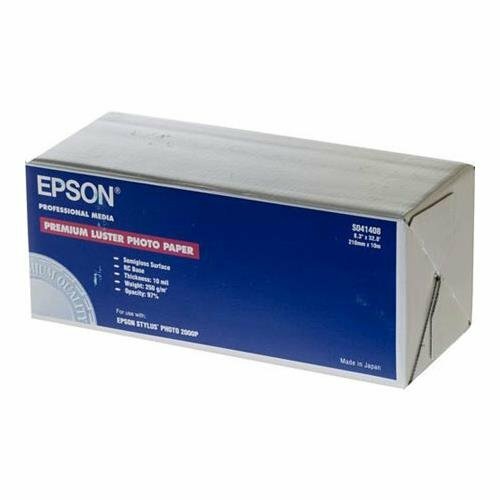 When I bought my Epson 890, I bought several different packs of Epson paper, this 8 X 10 one, an 8.5 X 11 one and some 4 X 6 sheets as well as the roll paper. 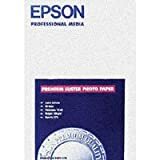 See my separate reviews on the others items (including the printer) also on this site, if you are interested in them. However, finally, I got around to trying the 8 x 10 paper. You see you wait until you have the perfect picture to do an enlargement. It did not dissappoint. Wow, the colors were great. I took several types of pictures and different lighting and the result were great. Now that I've tried it I'm hooked. People who have seen the pictures first of all can't believe they are off an inkjet printer. Then they marvel at the color and sharpness of the photo. One caution, those of you that think you can use any paper on any printer... Forget it. I had some paper from another supplier and when I used it on the Epson, the ghostly images were terrible. It seems not surprisingly that the printers are optimized for their papers. And to be honest, it is not worth the money to me to try a bunch of other manufacturer's paper only to find out the results would be bad. This paper is easier to find on the net. 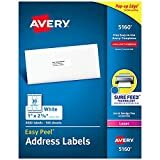 I have looked in my usual spots for this paper off the web and considering not only computer, office supply and grocery stores it is just not out there. Long lasting professional quality photos. Look and feel of a true photograph. paper, ink or printer problem? 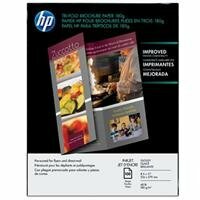 I've tried just about every HP paper type together with my HP Deskjet 5655 to resolve smearing problems. A4 or Letter sized Premium Photo Paper Glossy or Plus Glossy will smear seriously. If you look at the prints you get a feeling that the color is building up on top of the paper rather than being absorbed by it. You can even feel it. And if you put water on it, you can wipe it practically white clean in 10 seconds. Doesn't matter if you wait 3 minutes or 3 months, result is the same. However, make the same prints on 4x6in or 10x15cm HP Photo Paper, and they come out perfectly. You can even wash!!! the photos 10 seconds after printing and not a single trace of ink will come off. I blame the paper, but I'm starting to think that the HP printers only use the Photo Ink for small papers and that the regular Ink is used for large papers (I don't see any other pattern in my test results). I've wasted hundereds of dollars trying to get permanent printouts on Letter/A4 sized paper, but so far failed. I'm currently limited to using it for 4x6in printing only. FANTASTIC photo quality paper, but sheets stick together as they go through the HP printer.........other than the nusiance of having to reinsert the paper, this product is outstanding!! 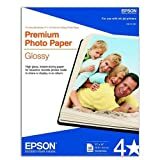 unless you live in 30% Relative Humidity year round it will wrinkle like a lasagna noodle.Bite the bullet and buy the much more expensive Premium PLUS Photo Paper unless you want to keep your pictures under glass or only show them in the winter.Please note, under glass does not mean in a frame, they will wrinkle there also. It is paper,I thought I would review it for you. 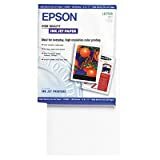 I stick it in the printer and print my pictures.Does what it is suppose to do.I like the price best of all. The best paper I have used. HP Everyday Photo Paper has met the challenge of delivering photo-quality gloss at an affordable price. 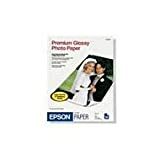 Designed for color-rich photo printing, it is heavier, thicker and glossier than plain paper, perfect for photos that you print every day. 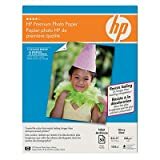 Perfectly suited for photos from e-mail and the internet, photo proofs and schoolwork - not to mention the photos you post on the bulletin (pin - UK) board and display proudly on the refrigerator - HP Everyday Photo Paper is the thumbs-up choice over plain paper for photos everyday. okay, so I bought this paper to produce tri-fold brochures. I will agree with the other reviewer that it prints beautifully. BUT - as soon as you try to fold it, it cracks and the top glossy layer of paper peels away like a bad sunburn. I WOULD NOT BUY THIS PAPER AGAIN. 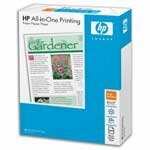 I have tried it in every possible direction in my printer but it is just very poorly scored. Do yourself a favor - buy regular glossy paper for one third the cost and fold it yourself - I guarantee it will work better. Streaks on printout when I first installed it. Put my old cartridge back in a everything OK.
big blobs and faded imgages. Photo Paper delivers a smooth, glossy finish for everyday photos with the look of true photographic prints. Ideal for creating brilliant photo quality color and life-like images. Print your own digital photos, reprints, contact sheets and enlargements. I was happy with this paper until I got the Ilford Galerie Smooth Gloss paper and it can not compare.Good value at Costco which used to sell it in a pack of 100 for $20 but for eye popping results go with Canon or Ilford glossy paper.More expensive but you get what you pay for. Best photo paper value on the market! I shot about 4.000 pictures within the last 3 months and printed over 1.200 of them. What paper do I use? This is one! It is my absolute favorite! Not only do I achieve an unbelievable color accuracy and picture quality but also the price is unbeatable! Sure, there are papers out there that are thicker and have a glossier finish but why would you want pay twice as much for that? Or more importantly, why do you need thicker paper and a glossier finish? 50 sheets for about $15 is as good as it gets! Generally I recommend Epson paper over HP, Kodak and Canon. Stay away from Staples and Hammermill paper. I use a HP 7760 printer and a Sony F717 camera. no exception. Has a tendency to deform even under 200 ppi. 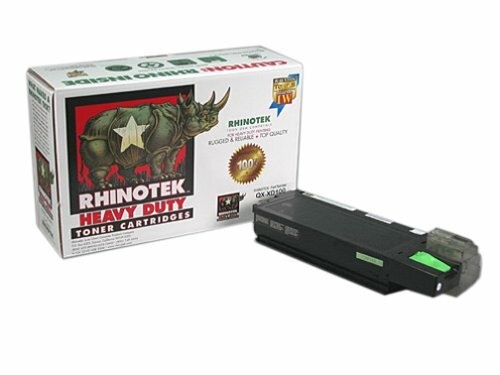 Use your ink jet printer to create professional looking invitations, announcements, reminders and much more. 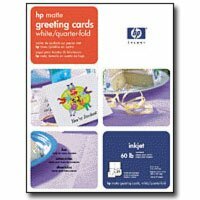 High quality, matte coated cardstock provides brilliant color and sharp text. Ultra-fine perforations allow you to separate cards easily and cleanly. Easy to format with Avery&reg; Templates in most popular software programs. Weight meets federal postal standards.